As of March 1, 2018, parents and families with a child support obligation in Baltimore City can receive services at a new office located in West Baltimore. The Baltimore City Office of Child Support Services, now operated by Veritas HHS, opened a second location within Mondawmin Mall, an area with plentiful free parking and multiple public transportation options. 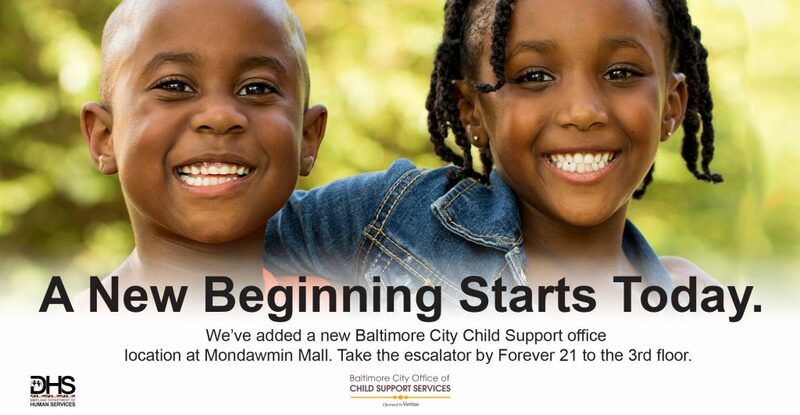 While Baltimore families can still visit the child support office located on the fifth floor of 1 N. Charles Street, parents are encouraged to use the location that is most convenient to where they live, work, or commute. Both offices are dedicated to serving custodial and noncustodial parents alike, and services include enforcement of orders, assistance with job-training and placement, right-sizing obligations, and other supports that can help fulfill obligations to Baltimore City’s children.